My sister came home from her weekly food shopping one day and brought home a plant so hysterically flowery, it made me gag. Very loud and very pink flowers with splashes of yellow and white in the middle—Bright! Happy! Flowers! “The plant lady said it’s Bangkok kalachuchi,” she said. Now, kalachuchi, we both remember. They were tall gnarly trees (well, we're short, anything over 65 inches is tall) that flowered profusely in cemeteries. But those flowers were white, not pink. The petals were thick and crisp, not fragile and creepy like roses or gardenias. They had a faint sweet smell that rapidly turned pungent if there were too many. A particularly vigorous tree would have spent blooms accumulating on the ground around it, giving cemeteries the signature odor of floral decomposition that kids in the barrio associated with the dead. It’s not a stink, it’s a kind of indecisive olfactory tingle that vacillated between molasses, gangrene and fart. 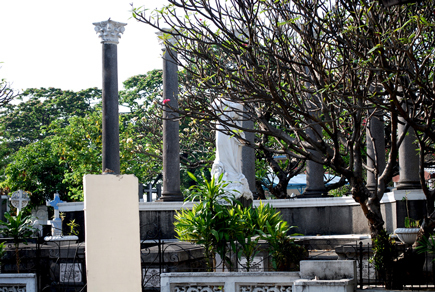 Walking by the public graveyard when the kalachuchi was in full bloom, the scent was actually nice from afar. As you walked closer, that same gentle scent would suddenly assault you and you gagged and ran. Every 10-year old knew that was the odor of the dead and the dead, obviously, always got up and tried to eat you. We'd never heard of Bangkok kalachuchi, though. We both thought it was probably the same thing, only pink. So, whatever. She had one, I wondered if I could get that in New Jersey. Lots of obstinate people around here who grow tropical and desert plants right smack in the middle of the 40th parallel. Even this pink abomination must be possible. It turned out, though, that Kalachuchi and Bangkok kalachuchi were not the same plant. They were not even the same genus. According to Wikipedia, both species originated from Africa (who didn’t?) and naturalized where they could. In the Philippines, kalachuchi (Plumeria acuminata) grows profusely as graveyard trees and hedge plants. They are so common you just ignored them. Bangkok kalachuchi (Adenium obesum), on the other hand, probably grew somewhere but we had never heard of it or noticed it. 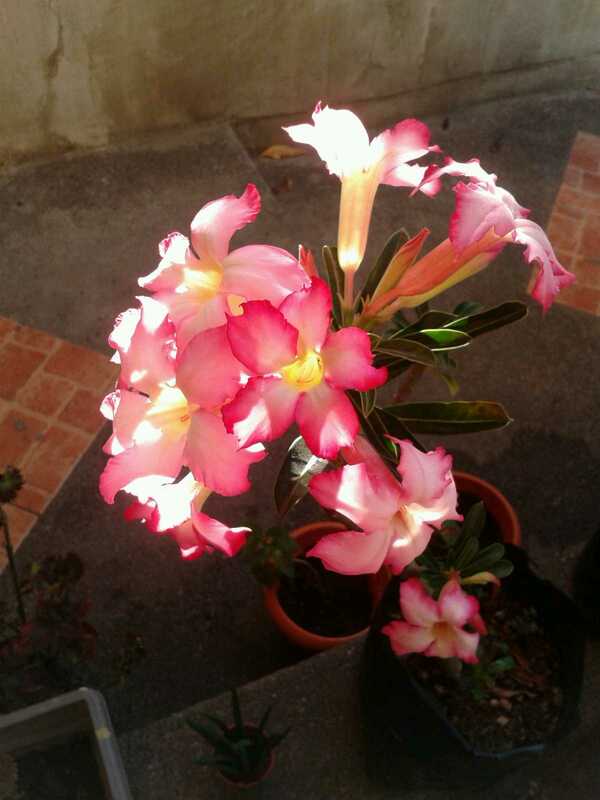 So Knitty Kitty, who loves pink flowery things, has this pot of adenium. Aside from the fact that the plant was completely naked (in dormancy, I was told), it looked like a plant that got tired, ignored all plant protocol and just---you know---sat down. On closer inspection, I realized that what it actually had was this funky inflammation that I guessed was some kind of adaptation to low water conditions. Big fleshy parts are expensive for plants to produce so there must have been a good reason for the swelling. That swollen trunk, to my growing fascination, turned out to be something called the caudex. There is a whole cosmos of similarly bizarre plants known as caudiciforms that use this camel approach to lack of water. which includes the most amazing of them all (but which I can't grow in a pot in my office)--the baobab tree. In Adeniums, the caudex develops only if the plant was grown from seed and then only if grown hard (more on this concept later). Weeks later, Knitty Kitty and I were shocked to realize that our conversations have turned toward the possibility of growing adenium from seeds. We're clearly approaching senility now, since neither of us has grown anything in our lives. But they are plants, yeah? You stick them into the soil and they ought to know what to do after that. Cultivation does not work like that though. Plants are experts at growing themselves where they occur naturally. But when you cultivate a plant, you are taking it out of its evolutionary niche and putting it somewhere else it doesn’t know what’s what. I can sympathize. I am a tropical fish and if I don’t know what to do with -12C, I can’t expect a tropical plant to know either. Think of it as a conversation. Outside of gene splicing, plants talk in compound sentences forming over generations stretched out across evolutionary periods. They’re not really known for quick repartee. If you put them in a different culture, they wouldn’t know the language, they wouldn’t have the words. Since you’ve decided to meddle in their affairs, it’s your job to create a situation where they can at least speak pidgin. Growing Adenium from Seeds In the Tropics. Oh okay, we did this too. All I can say is that this is a refreshing tutorial which, believe it or not, I was able to glean useful information, much of which had already been learned from experience, but it was nice to confirm. The blog is older than the dog's duty in the back yard from last week, but still useful. Now I hate to turn a noun into a verb (i.e., Google) but that's okay, here. And then we register with googlishous monikers. Nonsense! Anything can be nouned! Even on the galley proof, all one needs is red ink. And if you understood that, you're either older than me or you fell for it and googled it; even as Nouners and Verbers march on with Antipunctuationists. Seriously, glad you enjoyed the blog. Actual kalachuchi? I've only known it being grown from cuttings, even in the PH. There are eBay sellers from outside the islands but I do not recommend getting seeds outside the country unless they are properly inspected and cleared for safety. Imported diseases could harm local plants. very enjoyable exchanges. Now I know more about plumeria and adenium.